Barnes Holds off Charge to Capture 57th Senior Amateur in Playoff! Mayacoo Lakes Country Club, in West Palm Beach, was a perfect test for 139 top senior golfers to compete in the 57th Senior Amateur Championship. After 36 holes of stroke play and a cut made at 158 (+16) or better the Champion would be determined by a sudden death playoff! The final round began with Bill Barnes, of Bonita Springs, leading by five strokes at 140 for the tournament. Barnes held onto his lead throughout the front nine, remaining two under-par at the turn, while several players started to move up the leaderboard. One of those players was Temple Terrace resident, Don Whittemore, who posted four birdies on his front nine making it his best round of the Championship. The final nine holes served as a challenge for Barnes especially the final hole. On the par four 18th hole, Barnes laid up short of the water only to dump his third shot in the water and make an eight-foot putt for double-bogey for a final round 75 and 215 (+2) total. Within his same pairing group, Barnes watched Whittemore come from behind with an impressive low final round of 68 (-3)! Whittemore started the day seven strokes back, tied for third place, and ended the day tied for first place with Barnes! Barnes and Whittemore went head to head in a sudden death playoff to determine who would hoist the trophy. Whittemore, who won his last FSGA Championship in 2012, was ready to end his drought while Barnes was fighting to win his first FSGA Championship. The playoff was short lived as Barnes sealed his victory with a two–putt par on the first play-off hole, number 18. Whittemore missed his shot into the green left, putted through the green rolling to 20 feet on the fringe, and missed his par. 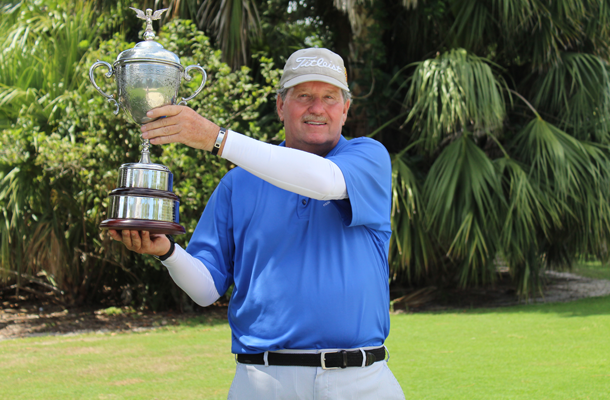 Barnes not only earned his first win but he is now exempt into the next ten Senior Amateur Championships, the next two Florida Senior Open Championships, as well as the 101st Amateur Championship and the 2018 Mid-Amateur Championship being played in May! David Anthony claimed solo third place, four strokes behind, with a final round 74 and 219 total. 2013 Senior Champion, Doug LaCrosse, 2014 Senior Champion, Pete Williams, Michael Mercier, and Richard Kerper tied for fourth place at 221 (+8). Since the number of entries received has always surpassed the capacity of the Championship, a qualifying stage was instituted in 2005. While 61 players earned exempt status through a variety of different means, nearly 300 participants attempted to qualify at one of six sites across the state, as competitors played 18 holes of stroke play hoping to advance to the Championship. Participants must be 55 or older to participate in the Championship. The 57th Senior Amateur Championship heads to beautiful West Palm Beach and the always immaculate Mayacoo Lakes Country Club. Enjoy a complimentary players' dinner on the evening before the first round as well as lunch before or after the first two rounds. For those not exempt into the Championship field, six qualifiers are held around the state to determine the field. Click here for a look at the 2017 Championship Results. Qualifying Fee: Qualifying Fee includes entry fee and cart fee. Championship Fee: Fee paid by those individuals who advance to the Championship through qualifying. Includes a players' dinner, tee gifts and gift certificates, course and cart fees, range balls, and lunch for the first and second round. Exempt Fee: Exempt Fee includes Championship Fee and Entry Fee for those individuals eligible for exemption. As well as the players' dinner, tee gifts and gift certificates, course and cart fees, range balls, and lunch for the first and second rounds. Late entries will be accepted subject to a $10 late entry fee should the entrant gain acceptance into the qualifying field. Those individuals who advance to the Championship through qualifying must pre-register and remit an additional $245 online at the FSGA website at www.fsga.org. Fees include lunch after each of the first two rounds and a Players' Dinner. Payment must be received by Tuesday, April 3 by 3:30 pm, or the individual will be withdrawn from the Championship. Championship Fee includes cart fees for all competitive rounds. Monday, April 2nd After 1:00 pm. Tuesday, April 3rd After 1:00 pm. Saturday - Sunday, April 7th - 8th after 12:00pm. Monday, April 9th after 10:30 am. Except for Monday 9th, we kindly request that competitors limit their practice on the range and short game area to prior their round only. First Practice Round at $35 per player. $86.00 per additional Practice Round. Please call 561-793-1700 to arrange your practice round. Requests for qualifying entry refunds received prior to entry closing date will be honored (less $20 per entry administrative fee). Requests received after the closing date will be honored (less 50% of entry fee). No requests will be honored within two days of the scheduled start date. Requests for refunds of Exempt or Championship fees prior to the pre-registration deadline will be honored (less $20 per entry administrative fee). No requests will be honored after the pre-registration deadline. The golf course will be set-up at approximately 6,500-6,600 yards. 18 holes of stroke play at 6 local sites. Cart fees are included in your qualifying fee. Players in the following categories will be eligible for exemption provided they meet all entry and eligibility requirements. Spectators and Spectator Cart Policy - Click here. Due to the limited number of carts available, spectator carts will not be available at this Championship. Caddies - Caddies are allowed in all FSGA Championships except Junior events. However, a player must not use a parent, step-parent or guardian as a caddie. The caddie MUST walk and the player's clubs must remain on the golf cart. $139 per room, per night, plus tax. Click here to book online. Mayacoo Lakes Country Club accepts cash, Visa, MasterCard and Discovery (No American Express).